If it seems I’ve written a lot of Model A profiles, you’re right. For some reason there are several people in my town who own them. And they just happen to be some of the nicest people around. This couple I’ve known most of my life. Sonja Hook was my piano teacher for several years. Small world, as they say. When some people buy an antique car, it’s the fulfillment of a lifelong dream. For Jerry Hook of Bluffton, Indiana, it was a dream with an encore. Years ago, Hook, a Wells county native, had purchased a Model A car, paying only $50.00 for it. The car ran well and since the previous owner only lived 12 miles from Hook’s home, he drove it home. The problem was, Hook was only 15 years old and didn’t have a driver’s license. He didn’t let that minor detail stop him. The car needed some restoration and over the next few years he completed those repairs. Hook eventually sold the Model A when he was in his 20s to help support his family. He had known before the sale he would regret getting rid of the car and he did. Over the next several decades Jerry and his wife Sonja raised four children. Today, their family includes 11 grandchildren and two great-grandchildren. Jerry never stopped thinking about owning a Model A and knew he could use it to entertain his family. Hook solved the problem in 2009 by deciding to purchase a Model A. He called Bill Milholland from Ossian to ask for advice. Milholland belonged to a Model A club in Fort Wayne and Hook thought Milholland would know of someone with a restored Model A for sale. Milholland knew of just such a car. It was a 1930 Model A in fine shape, needing no restoration, a fact that thrilled Hook. “I went through that with my first one,” he said. 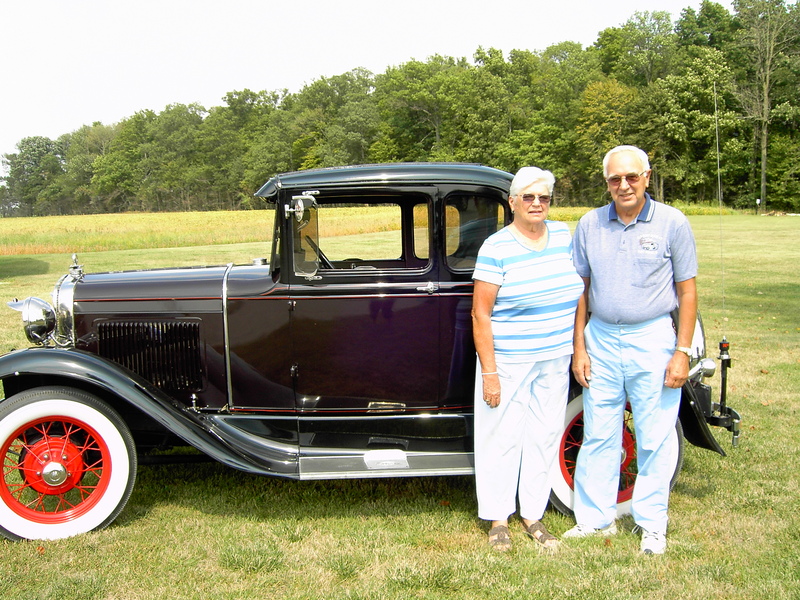 Jerry Hook purchased the car and as he had predicted, he drives the car for fun, often putting his grandchildren in the rumble seat for rides. The car has no power steering or brakes. The windshield tips out to allow ventilation. The car’s back window rolls down so air can flow through. The car’s body is painted maroon while its fenders are the traditional black color. Jerry admits he doesn’t drive it in the rain. “I’m afraid it will melt,” he quips. The gas tank holds 11 gallon, a change from the 1928 and 1929 models which held 10 gallons each. The Hooks joined the Old Fort Model A Club in Fort Wayne. “Most of the antique car owners I knew were members and it always looked like everyone was having a lot of fun,” he said. Recently the Hooks embarked on a tour with the group to Newcastle, Indiana. Suzanne: They are good people. You’ll have to get a classic car so I can write about you!